It is 1896 Inspector Thomas Pitt is now Head of Special Branch and whilst he is still getting his feet under his new desk he hears whispers from his contacts on the streets that there is a possibility of a potential assassination attempt on the life of a Austrian Duke who is coming to the London capital from the continent. He gets his men to check this out and there are some very suspicious sightings of disreputable foreign gentlemen enquiring into train time-tables and timings and destination of various trains and a couple of continental assassins have been seen in the vicinity of Dover. He puts his worries to the Foreign Office and gets some useful advice and he goes to see the Prime Minister to keep him informed. Meanwhile, there is concerns about the health of an elderly Italian lady named Serafina Monserrat who lives in Dorchester Terrace and is becoming very frail and worried that her many intrigues and affairs all over Europe in her youth will come out and cause embarrassment because she fears her dementia is increasingly a problem. Then she dies in unusual circumstances and foul play is suspected. These two story-lines connect between the investigations that Pitt has to make using help from Lady Vespasia and his predecessor in the Special Branch, Victor Narraway. This historic thriller was so atmospheric and intricately plotted right up to the conclusion that I just could not put it down. The story had elements of an Upstairs, Downstairs appeal about it and although Perry has written more than twenty previous books in this Inspector Thomas Pitt series it was not a handicap that this is the first that I have read as she provides full explanations. I see that Anne Perry has written many other books apart from this series but there is a freshness about her writing which makes it truly exceptional and I was transfixed until the final page. It was one of the best books I've read this year and I cannot recommend it highly enough. 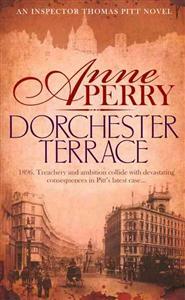 Read another review of DORCHESTER TERRACE.